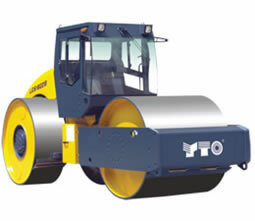 Our static three wheel roller is a kind of heavy duty static roller that can be used to compact gravel, sand-macadam mixture, crushed stone, sandy soil, stabilized soil, and bituminous concrete, etc. The compaction equipment is extensively applied in the construction of road base course and surface course construction of highway, municipal road, parking area, and industrial ground, and more. Static tandem roller uses mechanical drive mode. It is applicable to the compaction of bituminous concrete, and stabilized soil, etc. The tandem static roller is the ideal compaction equipment in the road surface construction of highway, municipal road, and industrial ground. We are a professional static roller manufacturer and supplier in China and can produce a wide range of static rollers to meet different requirements of customers. In addition, we also offer vibratory road roller, crawler tractor, forklift truck, and other construction machinery or agricultural machinery. For more details about our static roller or other products, please click on the specific product page or contact us directly. We sincerely hope that we can provide services for you.